THE GIRL WHO STOLE LONDON: Little Thing #002 // Hopelessly DevoTED. Little Thing #002 // Hopelessly DevoTED. Bun Batman and Bond. Yeah I said it. For my cinematic allegiance resides with a new kind of hero. A different kind of hero. A furry, filthy-minded, foul-mouthed bear called TED. Brainchild of Family Guy and American Dad creator Seth MacFarlane TED is the story of John Bennett (Mark Wahlberg), a 35 year old fella from Boston who as a wee boy made a Christmas wish that his beloved teddy bear would come to life and that they’d be best friends forever. John’s wish came true. 27 years on the pair remain inseparable - which would be great if TED hadn’t grown into a pot-smoking, lascivious layabout and long-suffering girlfriend Lori (Mila Kunis) hadn’t grown tired of John's frat party lifestyle. Que a classic 'romance vs bromance' storyline with a tawdry teddy-shaped twist. Those freaks, sorry, folks who do not favour the 'Family Guy' approach to humour should steer well clear. 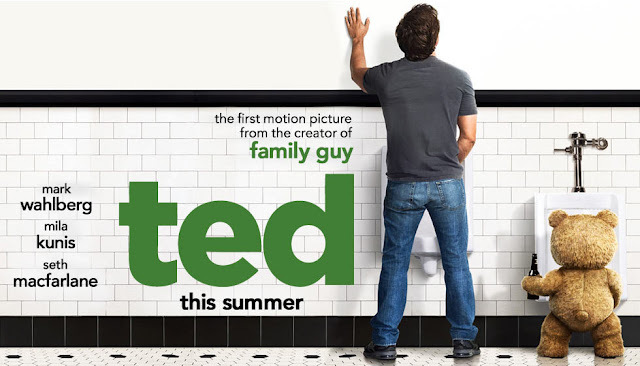 TED is exactly what you'd expect from MacFarlane's first foray into motion picture. Fans of his signature lewd, crude and often satirical style will not be disappointed with title character TED essesntially being Peter Griffin in bear-form. Personally I found it to be a complete and utter LOLfest, my face physically ached from laughing and I almost wet myself. Twice.